Although I talk on and on about the importance of owning basics and neutrals, sometimes you just need a statement or colorful piece to brighten up your look! 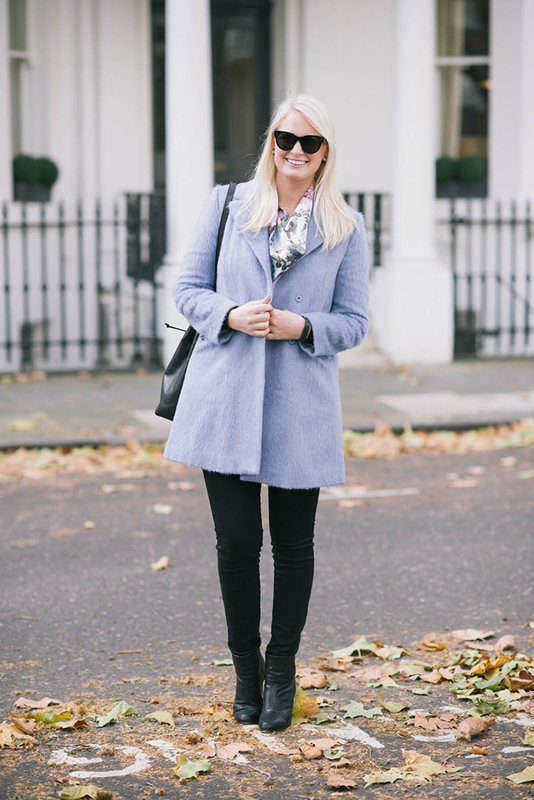 I found the perfect periwinkle blue coat at Topshop while in New York for fashion week, and was counting down the days until I could sport it in London! 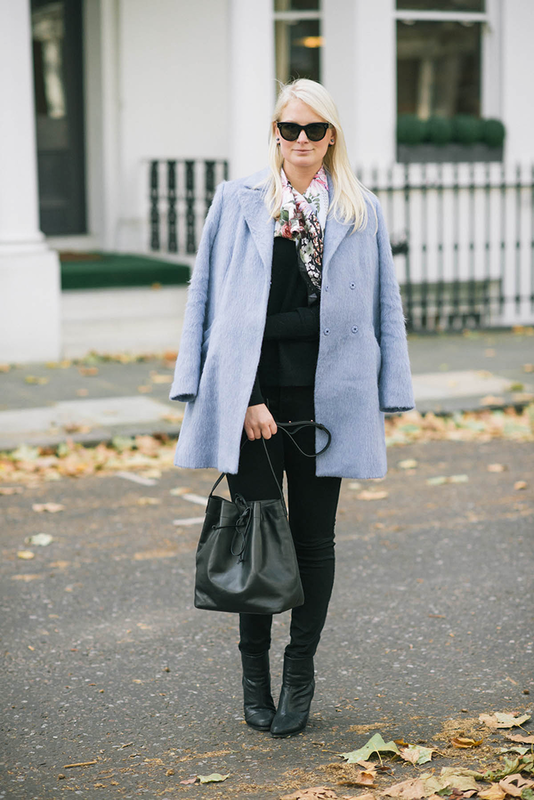 If I had to choose my favorite color (other than black), I’d have to say blue – I have a lot of navy, cornflower and powder blue in my closet, so this coat fit right in! 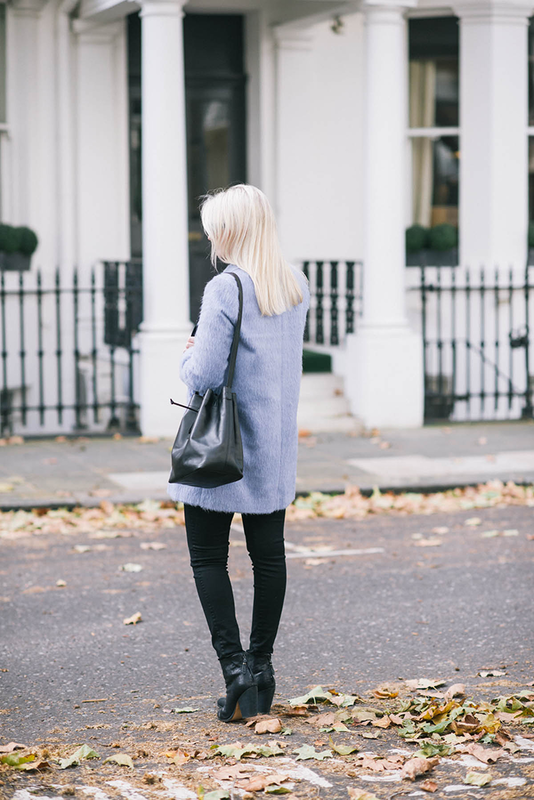 When THE OUTNET said I could pick out a few things to shoot while in London, I immediately looked for accessories that would compliment, but not take away from, the coat. First, I found this gorgeous Givenchy scarf – I love the pink, powder blue and black color scheme and the mixed print of roses and chains. 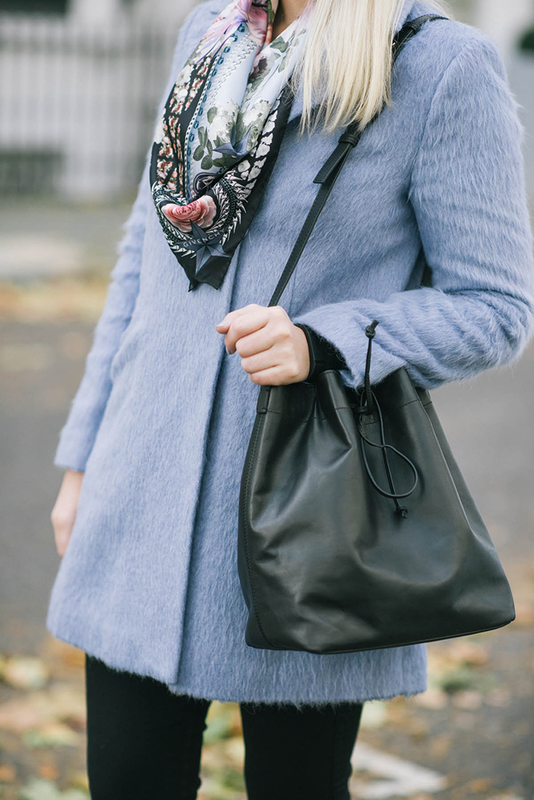 It looks wonderful around the neck (figure out all the fab ways to tie your scarves here), but just as pretty tied onto a handbag. 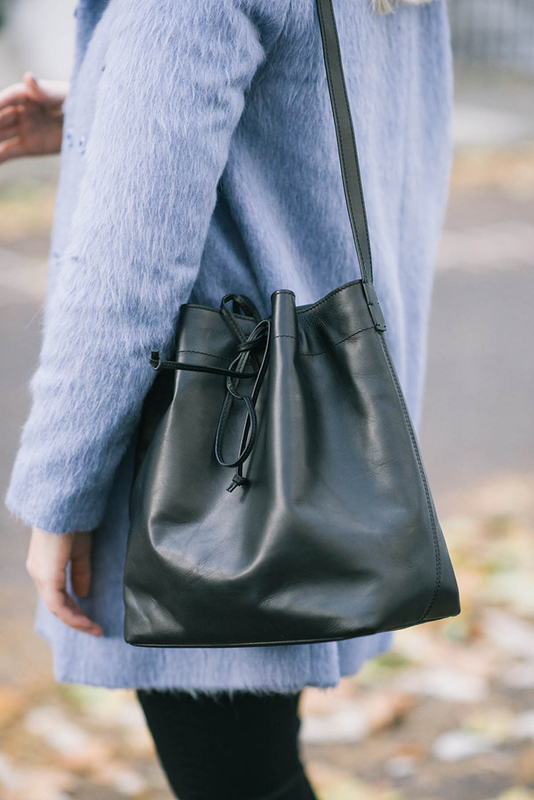 Speaking of handbags, the other item I chose for this look was a classic leather bag in a fashion forward silhouette – obviously this trendy (but timeless) bucket bag fit the bill. It’s another winner from THE OUTNET’s Iris & Ink collection and under $250. Be sure to check out all of THE OUTNET’s incredible pieces here. This scarf is fantastic, love this look and get some rest. That coat is absolutely stunning! I totally agree with you about needing a fun colored coat!! The vintage looking scarf is perfect! This is hands down my favorite look that you’ve posted from London! You know how much I love the color blue… and that coat is so pretty! Gorgeous coat! I love the texture on it. It’s the perfect addition to your chic all black look. I recently bought a similar blush pink one from Forever21. Like you, I can’t wait to wear it! beautiful coat. great color and great with the outfit you styled with it. What a pretty coat! It’s a great color on you, girl. This is a beautiful jacket! Periwinkle is such a soft and pretty color. Your scarf is amazing as well! In love with this jacket! The texture is amazing! I’m OBSESSED with your coat and bucket bag. The coat is beautiful on you! You look good inblue, so this was a great choice. And no, I can’t believe its November. That coat is amazing on you Merritt!